Cake boxes are typically designed to hold up to 100 CDs, DVDs or Blu-rays in a plastic cylinder case. They contain a spindle in the center to anchor the discs within the package. This type of packaging is commonly used for packaging discs for retail sale. 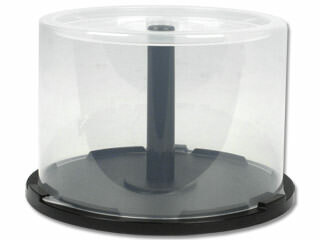 In many cases, the discs inside a cake box will come sandwiched between a pair of non-recordable blank "clear top" discs on both ends to protect the other discs from potential damage. Cake boxes are excellent CD packaging options for storing large quantities of discs in a small amount of space. They are great for storing archived discs and can be reused again and again. Common capacity sizes for cake boxes are 10, 25, 50, and 100 discs. This packaging option saves space for high volume media projects and provides a more permanent storage solution than shrink wrap.